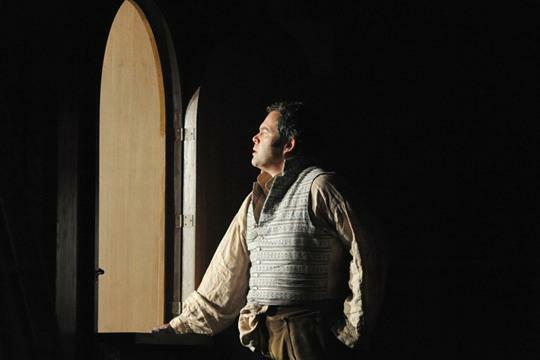 Glyndebourne’s first-ever Meistersinger, in a production by David McVicar, is a stupendous achievement. It is a big and ambitious undertaking for any opera house, let alone for a summer festival that is limited in terms of scale and space, but the Glyndebourne production team have responded to the huge and many challenges with intelligence, clever design and insight. In terms of execution there are a few things that are less than great (critical Beckmessers have to have their say!) but they pale into insignificance against the wonderfully solid, substantial toolkit of production values that sustain and inform this wonderful work. So, in short, it is a triumph, and from all accounts on the night I was there, a production that is getting better as the run proceeds. The scale of the undertaking is immediately apparent from the start time of 2.55pm – it feels slightly counter-intuitive to be eating a Glyndebourne picnic or cream tea at 1.45pm, waiting for the first bell. And the prospect of a performance spanning 6 hours and 40 minutes creates a sense of expectation, maybe a twinge of apprehension too that the dimensions of the piece could simply prove too big for this particular environment on the Sussex Downs. But then the Prelude starts, and the curtain rises on St Catherine’s church, and the citizens of Nürnberg populate the stage, and the whole Gesamtkunstwerk looks, feels and sounds so utterly natural that all prior doubts are simply swept away. 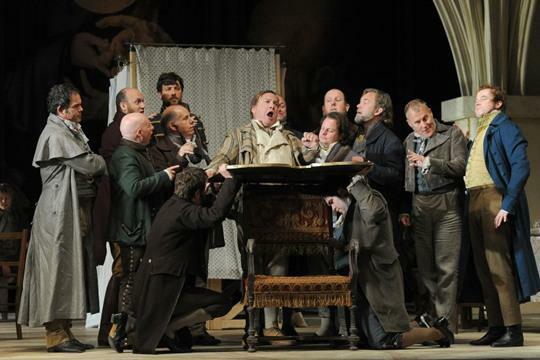 And as with his previous all-conquering production at Glyndebourne of Giulio Cesare, McVicar swiftly establishes a Personenregie that works brilliantly well: the stage is never (well, hardly ever) cluttered, the chorus move elegantly and, above all, musically, and the social interaction of real people, of different trades and classes in their respective environments, is depicted vividly for all to see. Among them are the Mastersingers themselves, all wittily and wonderfully characterized, very much at ease with themselves and with their social status, but full of humorous touches in their exchanges with each other. And indeed, for me, the single aspect of McVicar’s production that makes it so brilliant is his attention to humorous detail: the work bubbles with good humour, and McVicar brings it all out, recognizing the deft little echoes of onstage situations that Wagner puts into his orchestration of the piece and making sure (unlike so many other directors) that they do not simply sweep past unnoticed. It helps of course to have an orchestra and conductor on top form: on this showing, Vladimir Jurowski is relaxing into his account of the score, moving things along nicely but not driving the sound too hard, relishing the subtle interplay between orchestral sections, pointing up the contrasts in dynamic and texture that make the Meistersinger score so rich a tapestry. And as so often, the LPO play marvelously for him, with full-blooded string sound, burnished horns and brass and some very merry woodwind playing. The dynamic balance between pit and stage was not always right for my ears (we shall come to that) but overall conductor and orchestra gave us an exuberant, good-humoured Meistersinger, an affectionate account and one to cherish. 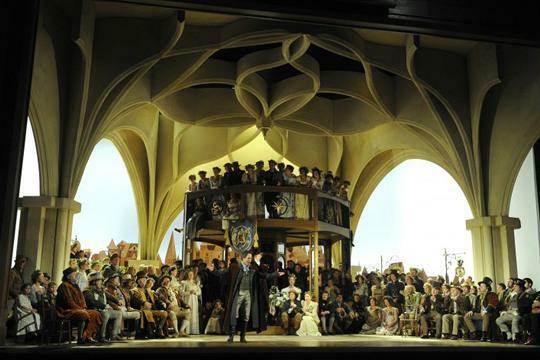 A feature of Meistersinger productions in my lifetime (I first saw it onstage in 1968 and have caught a dozen or more different productions over the years, mostly in Germany) has been a directorial tendency to raise ever-increasing doubts about the characters and their values as portrayed by Wagner. This ‘reading in’ of subsequent German history to a humorous opera by Wagner of 1868 may or may not have reached its apotheosis with the current Bayreuth production by Katharina Wagner (which I have not seen and do not intend to). McVicar however, often gloriously, simply leaves out any political message and concentrates on the human drama that emerges from the text and from the score – and what an effective piece of theatrical narrative emerges. So although it may always raise a momentary shudder when, in the final act, Hans Sachs sings of the threat of foreign encroachment on German values (and Wagner gives us plenty of string tremolandos in a minor key to underscore the point) or when he praises was deutsch, und echt ist, this is but a passing moment in a mildly comical, vaguely incongruous love story: young, noble hero Walther von Stolzing seeks Eva Pogner’s hand in marriage by winning a midsummer mastersinging contest, the rules of which he has neither time, nor inclination to learn. Presiding over the potential union of the young lovers is Hans Sachs, who helps Walther to gain his prize, despite his own undoubted feelings for Eva (and hers for him). Edmond Rostand explored the same love triangle with Cyrano de Bergerac: as music drama, expressed through tenor, soprano and bass-baritone, it offers rich musical pickings. And this is the emotional heart of the reading that McVicar gives to the piece, aided by the Hans Sachs of Gerald Finley that at times touches the heights of mastersinging, in a performance that is the complete package. His bass-baritone sound, warm, lyrical, intensely expressive (helped as well by his superb German diction) is complemented by an onstage character who becomes immensely sympathetic as the evening progresses. Here too the Personenregie of McVicar illustrates and clarifies the narrative: when Hans Sachs hands Eva over to Walther, she hesitates and breaks away – her own feelings are too confused. When Beckmesser stands aside and alone at the end of Act Three, beaten and humiliated, Hans Sachs crosses quietly to him and takes his arm – they are still friends and fellow mastersingers. When Hans Sachs is crowned with the garland of flowers he removes it and throws it into the crowd; he, after all, is still a man of the people. Finley illustrates and conveys all this with natural ease, moving beautifully, and singing the role as thrillingly as I have ever heard it. It is a stunning assumption of a part that many people had thought called for a ‘bigger voice’. Well, Finley’s voice is not only big enough, it is noble, resonant (his bass extension is particularly fine in the Glyndebourne acoustic) and utterly right for the part. His ovation at the end told its own story. Several notches down in terms of quality of singing are both the Eva of Anna Gabler and the Walther of Marco Jentzsch. Paradoxically (or perhaps naturally), this makes Eva’s decision to opt for Walther seem even more perverse than usual! Gabler looks and acts the part extremely well, succeeding in making Eva seem touchingly vulnerable, girly, excited and genuinely perplexed at all the appropriate moments. But her soprano, although pure and accurate enough to give a perfectly decent account of the role, fails to soar in the ecstatic passages that Wagner gives her, and her sound becomes a little wobbly under stress. Here she was not helped particularly by Jurowski – he made her work hard to sing over the wall of orchestral sound that accompanied her in the big moments, and as a result she failed to thrill. But she took her line in the quintet very nicely, right up to the ff passage, and as a performer I liked her. Jentzsch was also small of voice for Walther, but sang the role extremely intelligently, holding back in the early stages in all the high passages and only venturing into no-holds-barred territory in the final act. His tenor sound is dark in timbre, but quite sweet and pure in terms of intonation. He also played the part of the outsider in a small community quite deftly: he often looked slightly awkward, not quite sure where he fitted in, uneasy to find himself the centre of attention. This was not a swaggering Walther (such as I have often seen) but a rather sensitive, perhaps dreamy or even moody young man, besotted by the attractive appearance of Eva and then doing what he is told to get her. As a sing, it was moderately successful: nothing ugly or awkward, words conveyed with understated lyricism, always pleasing to listen to but neither thrilling nor truly exciting. For thrills and excitement we needed a convincing Beckmesser, and Johannes Martin Kränzle rose to the challenge in spades. This was an inspired performance – pompous, smug, but also alert and quick-witted, and wonderfully well sung. Kränzle understood above all how to deliver the role, bringing Sixtus Beckmesser to life (and succeeding in making him not unsympathetic), oiling his way among his fellow mastersingers, a sneer in one direction, a respectful nod in another, always tidying his ridiculously glossy mop of black hair and listening, watching, waiting. McVicar avoided completely the Jewish caricature figure that Beckmesser is sometimes made to become. This Beckmesser was a solid, respected Nürnberg citizen, and Kränzle made the role his own. His baritone sound is clear, well-focused and his diction superb. Hugely enjoyable. The mastersingers were all strongly cast, pride of place going to Alistair Miles as an immensely sympathetic Pogner, whose warm bass sound and sense of melodic line made his passages of dramatic narration as enjoyable as they should be. And what riches among his colleagues: it was sheer delight to hear each mastersinger introducing himself, with voices of the quality of Robert Poulton, Andrew Slater, Henry Waddington and others. That brings me to the last two principals – one a delight, the other a slight disappointment. Michaela Selinger was a bubbly, vivacious Magdalena who characterized the role with a strong singing performance: always interesting to watch, her mezzo soprano voice is full, incisive and projects extremely well. Opposite her as David however, Topi Lehtipuu made much less of an impression. The role lies well for his high tenor voice, and his sense of phrasing was perfectly alright, but the sound was light and failed to resonate. David has a long and crucial sing in the first act, and must make an impression in this section of the opera: unfortunately, Lehtipuu failed to nail the part. As with Eva and with Walther, he was perfectly musical and agreeable to hear, but the part simply demands more heft. A missed opportunity here. All that said, and the slight musical weaknesses given due weight, this remains a five star account of Meistersinger, and a production I cannot wait to revisit when it is revived (as it inevitably will be – hopefully for many years). Good humour, humanity, human values, witty interplay onstage: all these, combined with superb orchestral sound and a visual evocation of early nineteeth century Nürnberg that is never less than a pleasure to look at, make this production a thing to be treasured. Add to that a debut performance by Finley, who will surely become the Hans Sachs of our times, and you have a triumphant Meistersinger. Plaudits to all concerned.